Barbara Mueller looks on as Chairman Roger Brody holds the photograph to be placed on the USSS Hall of Fame wall at the American Philatelic Center. Barbara R. Mueller has been inducted into the Hall of Fame of the United States Stamp Society. The Board of Governors voted unanimously to honor one of the most honored members of the philatelic community. Induction into the Hall of Fame is the Society’s highest honor. Mueller becomes the eleventh person so honored. Her contributions to the Society and philately are remarkable. In addition to chairing several Society committees including the Postal History and Markings Committee and the Essays-Proof Committee, Mueller served as the Editor of The United States Specialist from 1972 through 1977. She has been a prolific contributor to that journal for over six decades. Barbara also has served as editor of two other important philatelic journals, The Essay-Proof Journal and Paper Money. Barbara has authored three books: Common Sense Philately, United States Postage Stamps and Postage Stamps and Christianity as well as numerous articles on a diversity of philatelic subjects from design and art to postal markings and the U.S. registry system. Barbara Mueller has been a valued contributor to the Society and is unquestionably one of the most important philatelic researchers and writers of the 20th Century. She was the recipient of the APS John N. Luff Award in 1956 and signed the APS Scroll of Distinguished Recipients of that award in 1973. Barbara is recognized in the APS Writers Unit 30 Hall of Fame. In 2003 the Board of Governors of the United States Stamp Society recognized Mueller for her long and valuable service presenting her with the Society’s Century of Service Award. In 1981, Barbara Mueller was awarded the Alfred F. Lichtenstein Memorial Award for Distinguished Service to Philately. Louise Boyd Dale, Patricia Walker and Barbara R. Mueller are the only women to have garnered this prestigious award. A framed photo of Barbara R. Mueller will be displayed in the United States Stamp Society room at the American Philatelic Center along side of previous Hall of Fame honorees, Hugh M. Southgate, J. W. Lundy, Arthur E. Owen, Walter R. McCoy, R. A. Bryant, Sol Glass, Walter A. McIntire, George T. Turner, Morton D. Joyce and George W. Brett. The award was presented at the 80th Anniversary Celebration dinner at the Smithsonian Institution’s National Postal Museum on May 30, 2006. 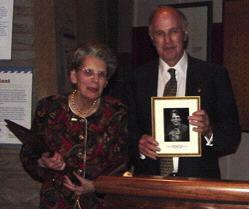 The Board of Governors of the United States Stamp Society is honored to induct into the Hall of Fame, Barbara R. Mueller, of Jefferson, Wisconsin, who, exemplifying true scholarship and devotion to philatelic research for almost 70 years, has given unstintingly of her time and effort in the service of our organization.